Posted on October 10, 2013 at 10:46 am. Founded by the energetic Prof Dylan Evans Jones, The Wales Fast Growth 50 has become the established award that entrepreneurial businesses in Wales aspire to. The annual gala dinner was held last week in Cardiff with a full house of 500 guests and has developed into the largest Welsh business event of the year. Over 25,000 jobs and an estimated £14billion of additional turnover is delivered annually by these up-and-coming companies, much of which is spent in their local area. Yet despite this success, much remains to be done to turn fast-growing firms into super-growth companies that can have a major and continuing impact on the Welsh economy. Dialogue are expanding their global footprint by identifying scaling companies who wish to expand globally and Wales is one market worth exploring. 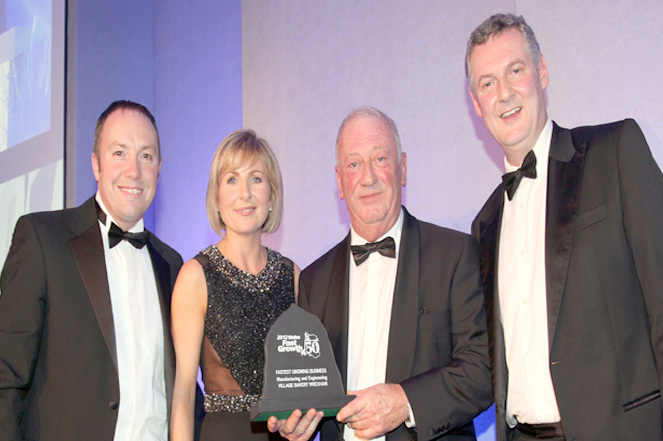 Michael Killeen, Dialogue Chairman, presented this year’s fast growth award to Village Bakery of Wrexham. ‘’It was a superb event, reminding us of the early Celtic Tiger years when Irelands pride and confidence were at an all-time high. There are tremendous opportunities for Irish service companies to assist Welsh growing companies to a new levels of super growth beyond the UK borders’’. Dialogue has expanded its international reach working with companies in Israel, USA, Russia and India. The Welsh exploration was inspired by an opportune meeting with Dylan Evans Jones. ‘’It was a real knock on the side of the head. Here we have English speaking business people happy to work with Irish neighbors rather than London or Manchester based agencies.’’ Killeen said. ‘’There is high energy in Wales at the moment and the UK Government are keen to support this momentum.” Unlike Irish people, the Welsh people are more insular and Killeen mentioned on the night for the need of a collaborative effort to start branding Wales Inc. and linking with their diaspora around the world to open up new markets. He was booed off the stage.